There is a reason I am being slower than I usually would on a project like this. I am working on a secret sewing related project that I don't want to share just yet !!! I am being so slow I will not be able to complete the other Halloween projects I wanted to this year as I want to dive straight into the final page of Siberian Forest in order to get it finished by the deadline (December 1st). Don't forget IHSW this weekend, click on the link in my sidebar for more info. Nice progress, I love the pumpkin!! 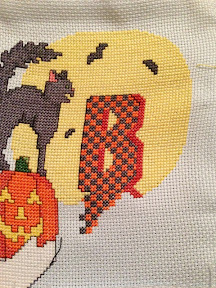 It must have been fun stitching that letter B! I bet you're glad to be done stitching all that yellow for the moon. It looks great! Boo to You is looking good! I'm excited to find out what your secret project is.